Get your mind into the gutter! For most people, cleaning out gutters is not exactly their idea of fun. But, if done often enough, there is absolutely no need to dread it. Unfortunately, many homeowners don't realise just how much damage can be caused by clogged, leaking or broken gutters. 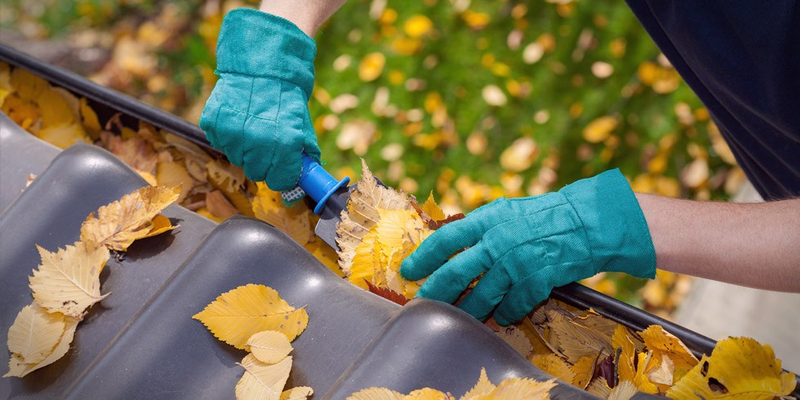 Make sure your gutters are cleaned at least twice a year, especially after autumn and again in the spring before the summer rains start. Use a safe and sturdy ladder; one with a small shelf strong enough to hold a large bucket to collect debris and leaves is prefereable. Put on some gloves and find a bucket or large plastic bag to collect the leaves and dirt so you won’t have to pick them up from the ground later. If you prefer not to use your hands, get hold of a short rake or another tool of your choice to remove leaves and dirt from the gutters. If you are using a metal tool, be careful not to damage and scrape the bottom of the gutter. Make sure to always scrape debris away from downpipes, otherwise you may accidently block the pipes. Once you are done removing dirt and debris, use a hosepipe or bucket to pour water into the gutters. This not only gets rid of excess debris, but it will allow you to check for any leaks. After all the gutters are cleaned out, pour water down the downpipe (at full pressure if using a hosepipe). If the water backs up out of the top, the downpipe is blocked. Normally, downpipes can be unclogged by tapping on the side of it. If that doesn’t work, try flushing the downpipe out from the bottom. Cleaning gutters more than once a year not only means that it is a lot easier and less time-intensive each time, but also ensures that you lower the risk of any damage to your house, therefore preventing costly home repair bills or insurance claims.